House music has enjoyed yet another incredible year, with 2019 looking set to continue to provide yet more amazing additions to the genre. 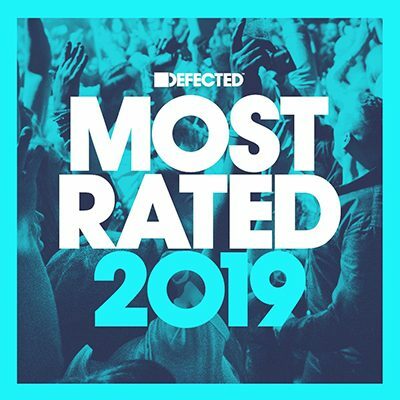 ‘Defected presents Most Rated 2019’ celebrates the wealth and variety of house created, played and enjoyed on dancefloors worldwide, showcasing the records that are dominating club sound systems right now, and the future classics that are emerging from this year. Most Rated presents the key tracks of the moment, the heavy hitters of the future and your DJ essentials in one unmissable package of unedited, unmixed and full-length tracks. Defected’s 2019 edition of the compilation brings house heat from key artists like Honey Dijon, Peggy Gou, Mella Dee and Andhim alongside Defected friends and family Melé, Purple Disco Machine, Riva Starr and CamelPhat. Most Rated 2019 features standout tracks like Weiss’s ‘Feel My Needs’, with its unmistakable piano riff that has been taking dancefloors by storm all summer long. Purple Disco Machine’s remix of Fatboy Slim’s ‘Praise You’ gives a seminal record new lease of life for 2019, whilst ‘(It Happens) Sometimes’ sees David Guetta return to his underground roots as alias Jack Back. Most Rated 2019 also features tracks that reflect the continuing resurgence of classic house and disco sounds, with ‘Bizzness’ from SoulPhiction, and rising star Mighty Mouse’s latest musical offering, ‘The Spirit’ both channelling an old skool vibe. Other exciting cuts include Paul Woolford’s ‘Don’t Waste My Time’, which delivers a direct slice of percussive house music, and Andhim’s remix of ‘Ngeke’ by Armonica and Toshi, which gives the compilation a dose of icy-cool eccentricity. As expected, the compilation offers a diverse range of house music, from tech-inclined beat to the soulful vocal cuts that characterise Defected’s sound.